Whether at home or on the road my most trusted application to get me out of bed in the morning is mobileCLOCK – the best all-in-one alarm, timer and stopwatch software for your Treo. I have been using mobileCLOCK for a couple of years now and from day one what appealed most to me was its simplicity and overall usability thanks to large time displays and full thumb controls as well as the fact that it can play individual MP3 files or (as I just discovered) individual MP3 files selected at ramdom in a particular music folder as your alarm’s sound. Setting up your morning alarm (or any other alarm for that matter) with mobileCLOCK is only a matter of a few clicks. 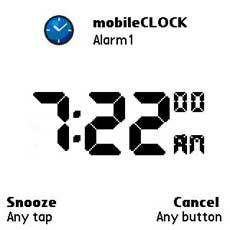 After launching the application whose main screen displays the current time (below left) select and press the alarm clock icon. 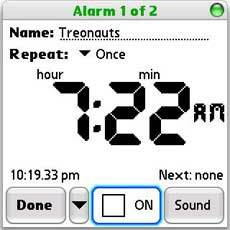 Then on the next screen (below right) select the time for your alarm (you can use either your thumbs on the touchscreen or numbers on your Treo keyboard). After selecting your alarm’s time you’ll need to select the sound that you’d like to associate with it by simply clicking the ‘Sound’ button. You will be presented with three possible ‘Types’ of sounds – File, MIDI and BTone – with ‘File’ allowing you to access any MP3 music on your SD card. 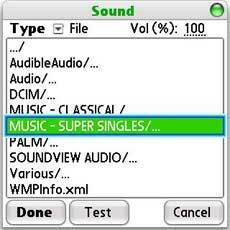 By selecting an entire folder (“Music – Super Singles” in my case below) _without_ selecting an individual MP3 file in that folder mobileCLOCK will randomly select one of these as your alarm sound – something which I have found particularly useful on the one hand because I avoid the monotony of having the same music waking me up every morning while on the other hand it also saves me from the hassle of reselecting an MP3 every time that I set my alarm. After this all you need to do is select ‘On’ to activate your alarm (below left) and you’re all set to go to sleep while mobileCLOCK for its part is set to wake you up (below right) singing to your favourite tunes in the morning… To snooze your alarm you just need to tap your screen or to cancel it simply press any of the main application buttons. I am sure that you’ll appreciate the simplicity and versatility of mobileCLOCK’s basic functions but if you’d like to venture somewhere just minimally more complex I’d suggest going to Menu > Events > Settings and choose the ‘Trigger’ tab (below left). 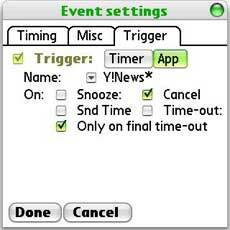 The Trigger is a function which allows you to either start a new timer (alarm) or launch any one of the applications installed on your Treo after your set alarm starts. 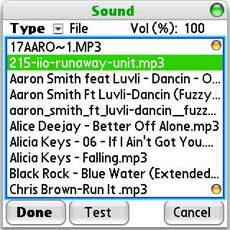 Overall, if you’re looking for the very best MP3 alarm available today for your Treo then there is no doubt that you’ll be absolutely delighted and very impressed with mobileCLOCK’s rich and yet extremely simple to use features. what is the theme that you use? looks very mac like! how do i install that on my 650? Andrew, can this application set two alarms per day? I need to have two go off every day. Treo Alarm does that. How do you assign a favorite under applications for the trigger? Btw thanks I never knew what 'trigger' was for. You can set multiple alarms per day -- I think the cap is 99, once you register. Multiple alarms is a registered-version only feature, so you won't see it on the demo download. 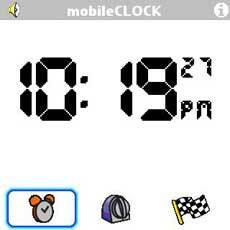 George - my understanding is that MobileClock can set an 'infinite' number of alarms and timers. Andrew, you mentioned playback from MP3 files, however whenever I choose a file Mobileclock reports the error: File or BTones playback requires 'mobileSOUNDlib' v1.35 or greater. Please advice. Thanks in advance. Andrew, please disregard my previous message, upgrading to v3.9 solved the problem. Keep up the good work!